Hey everyone! Last night on G4 we premiered Starhawk’s Space Combat trailer! And if you happen to be too busy tracking the orbit of ELENIN, and didn’t get a chance to see it on X-Play, then shame on you! But don’t worry! Don’t despair! We’ve got the full, extended version of the Starhawk Space Combat Trailer right here. Click it! Play it! Let it burn its shooter-goodness deep into your eyes! So this video was cut together by our team in San Diego, California and was captured from gameplay on our Capture the Flag Small Orbital Platform map. The trailer gives a really great taste of what our space combat is like in Starhawk! You may have seen some of our previous gameplay vids that were recorded on one of our Acid Sea maps with its cool-looking terrain, jagged spires, and noxious acid. But what’s really awesome about the Orbital Space Platform maps is that they feel urban, with city and street combat and that’s something that we’re really happy about! The team and I here at LightBox Interactive really want each of our environment types to have a unique feel, but still all based on the fast-paced troop, vehicle and aircraft gameplay that our fans love. And because of each environment’s unique structure and style, our Build & Battle mechanics feel really cool and fresh in each of the environment as well. We absolutely love this and hope you all will too because it allows players to not only adapt their combat tactics per environment, but their support and building tactics as well. Up to this point we’ve pretty much only showed Starhawk at venues where you needed a pass or some kind of credentials like E3, Comic-Con, PAX, Gamescom, or the upcoming Eurogamer Expo, or GAMEfest. Basically conferences, expos, closed-door meetings, and back alleys — that all changes now! Maybe some of you have heard of the Alamo Drafthouse’s Fantastic Fest here in Austin. It’s an awesome film festival specializing in horror, fantasy, sci-fi, action… ya know, “fantastic” movies! They have an arcade portion of the festival focusing on indie games called Fantastic Arcade that is totally open to the public (and FREE) and it’s held at the awesome HighBall Lounge! So we thought, let’s setup a LAN party and give the public a chance to play Starhawk! So if you’re in the Austin area and interested in getting your hands on Starhawk, swing by the Highball on Thursday, September 22nd starting around 5pm. We’re gonna have a LAN party of 12 PS3 stations, each decked out with a 40” SONY Bravia EX 400 HD Monitor and of course Astro headsets. We’ll be holding a Capture the Flag tournament too and there will be prizes but honestly, I’m not sure what the prizes are going to be but Sony is providing them. We’ve also got something really special planned for all our fans that show up to the HighBall for our Starhawk LAN Party — It’s a voucher code for an exclusive multiplayer skin for Starhawk! So swing by, play Starhawk, play the other games at Fantastic Arcade, hang out and meet the LightBox Interactive team! Oh, and one last thing! 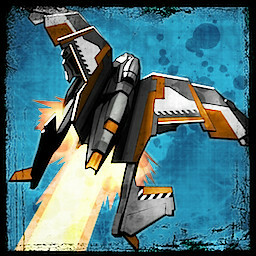 Here’s a Starhawk avatar if you’d like to use it for Twitter, NeoGaf or some other forum. Keep your eye’s on www.StarhawkTheGame.com and the PlayStation.Blog here for the latest updates and announcements on Starhawk — and boy, do we have some big ones right around the corner! Rock out with your Hawk out! Oops I just rated this 1 out of 5…… Delete, delete, undo, undo!! That was supposed to be 5 out of 5!! Love the footage and can’t wait to see the what else you can pack into this game. Really, sorry about the rating….. Editor fix it please. AMAZING! This looks so polished! I love the laser beam turret and the mech stomping the enemy was great. Please give us a few more space levels if possible, after all the game is STARhawk. Pleaswe consider finding a way to keep Zones in the game, it was one of the most popular multiplayer levels. One complaint, I can’t expand the photos included in the blog post. They are hosted on flickr and it wants me to sign in. I signed in and now it just says ‘private page’ when I click the photo. I am particularly interested in the map photo included in the blog post. Am I missing something or can this be fixed? Keep up the great work Dylan, Harvard, and team! And to me it looks like all the images are expanding properly *except* the map screen image. I just emailed the blog team to ask if this can be changed. What an awesome trailer! I got to play Starhawk at Comic Con in San Diego and loved it. I can’t wait to play this game!! Keep up the great work guys!! Glad you got a chance to play it!! We’re looking for more ways to give players a chance to get hands-on with Starhawk. Both here *and* over seas! These aren’t normally my style of games, but I have been very impressed with the information and footage of the gameplay. I am about 75% sold that this will be a must own for me. Bravo. lets hope we can get the next 25%! That’s not such a bad percentage given that we aren’t done with the game yet!!! Follow our progress, get a chance to play it if you can, and hopefully we can add you to our growing community! I chuckled @ 0:41. they was just maybe talking about what there day was going to be consist of and out of no where BOOM! I know! Like they didn’t hear the rocket screaming down on them? And as a bit of trivia, that pose of touching the keypad plays in-game whenever a player interacts with his Uplink. Because remember, in Starhawk you can access the server list and all other multiplayer, party, clan and community features while you are actually *IN* game. You don’t need to exit your game to interact with that stuff! Anyway game looks great………..day one. We’ve seen feature asked for by a bunch of people and you’re right, it is really convenient! Right after reading your comment I grabbed our Lead Online Programmer, Jim Young and asked him about it (he’s a big COD fan btw) and he was saying the current build of Starhawk doesn’t support it but he’ll take some time to look into it. You are talking about the same thing that Little Big Planet does, right? …but are there any significant differences in the way you play in “space” and on land? From the video, it seems that gravity looks pretty much the same. While each map plays very differently with regard to layout, flow etc., we do our best to keep the core game the same. We only change it for some of the FXs. The gravity that effects the vehicles and players is the same between the Orbital Space Platform maps and the Planetary Terrain maps. This was to ensure a level of consistency in Starhawk’s core combat. man this is insane !!!!! warhawk till this very day still remains my best online experience on the system , hoping to see starhawk raising the bar !!!! We hope so too! And please know that the team and I here at LightBox Interactive are working really hard to make sure we exceed what you’re expecting! Okay, trailer is awesome but I have questions good sir. First do the Outkasts not breathe? How do they live in space and fight? There’s a potential here for more back story. Looks wonderful, I can hardly wait. How can the Outcast breathe in outer space? Once Rift Energy has anchored with a human body (takes about 60 painful days) it has replaced many of an organic body’s core systems (nervous and circulatory). So it’s at that point that oxygen is no longer needed at all. In fact, there is no blood present in an Outcast body after anchoring. Do weapons overheat quicker in space? NO. The overheat timings are the same because we really don’t want to mess with those core rules. Players get so accustomed to things like that as the master the game and we don’t want to alter core game rules like that. Looks fantastic! My only concern is that the space maps seem to mostly be a cosmetic change from the regular ones. Don’t worry, I’ll still be there, blowing up anything and everything that doesn’t belong in MY skies. One of the key maxims that we always consider here at LightBox Interactive is that the “Core Rules” of the game stay intact on every map. This is why we don’t change gravity, or overheat times, or weapon trajectories on a per map basis. Would it be different due to lower gravity — sure, in reality! But we just feel very uncomfortable changing that stuff per map. So when it comes to maps, we are mostly looking at layout and visuals — but that can have a massive impact on a game! For example, the open rolling planes of Dust play very differently than the Orbital Space Platforms, even through the “Core Rules” of Starhawk are the same in both maps. Hope that answers your question!!! I sure hope Starhawk is as good if not better than Warhawk Warhawk was the reason I bought my PS3. Damn good choice. Can we pre-order Starhawk now. 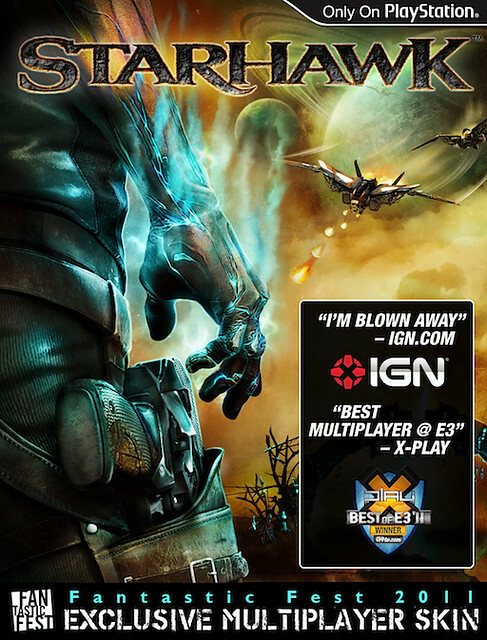 We are doing our best to make sure that Starhawk lives up to the expectations of our fans around the world! Hopefully you can get a chance to play it hands-on either at an event or during our beta (which we have mentioned NOTHING about yet). Once you’ve got to play it, you’ll have to let us know what you think!!! Jet packs. Splendid ol’ boy. When I lost my favorite Fallen Star server in Warhawk, the game was sadly never the same. Never again! We love the jet packs! But we are also making sure that we fix some of the glitches and issues that some players had with them in Warhawk. And even in their unfinished state, the Starhawk jet packs already feel great! Loving the space combat!! Will all space battles have some sort of landscapes? I’d be even more hyped about this game to see the inclusion of outer space environments where hawks battle it out to take down each others capital ships. Perhaps utilize the Build & Battle system to not drop, but install turrets and extra hawk hangers in capital ships? This Space Station MP looks great! Cannot wait for this game! Now people could fly under the maps and they wont be glitching! haha, very cool. Also, Dylan, i def wont be able to make it to the fantastic fest, but i was wondering if StarHawk will be showing up at the NYC Comic Con in October? My second question is, will that Avatar be available on the PSN too? Sorry you won’t be able to make it to Fantastic Fest! And I’m not sure if SONY is showing Starhawk for the New York Comic-Con in October. I know there was talk about it but I’m not sure. ugh — I didn’t answer your last question. Sorry about that! SONY does have plans on releasing new Starhawk PSN avatars but I’m not sure of the exact dates. When they get uploaded I’m sure we’ll give you guys a update, here or on the Facebook, page as soon as they do! Guys this is just my $.02, but this game is really complicated already, I think adding in gravity changes and overheating weapons, and not being able to breathe in space might be too much…..I think they are doing a smart thing by keeping the space gameplay mostly cosmetic, though flying from platform to platform and through asteroids is a big change from the planets. Again, just my humble opinion. Harvard’s right — we are always focused on fast fun rather than “reality”. You guys have raised the bar pretty high, Raising Industry expectations once again. ..and if so does it count against them to do it ? Anyways, I have a question about weapons. I know the hawks have pickups in the sky much like they did in Warhawk, but how about the people? Will we be able to explore around to get weapons, or will we have to collect and upgrade bases to get them, mixture? ALL I NEED TO KNOW IS A RELEASE DATE..SO I CAN PRE ORDER AND COUNT THE DAYS DOWN..I ALSO APPRECIATE HOW THERE ARE JET PACKS AUTOMATICALLY AVAILABLE IN EVERY MAP, I AM A HUGE FAN OF JET PACKS BECAUSE THEY GIVE YOU A LIL CHANCE TO LIVE IF YOU IN A WARHAWK AND ABOUT TO GET DEMOLISHED..YOU CAN JUST EJECT FROM THE WARHARK AND JET TO ANOTHER SAFE LOCATION..:P AND THIS BRINGS UP MY QUESTION …ARE WE GOING TO BE ABLE TO DO THE SAME IN STARHAWK? AND ONE MORE THING…THE RADAR..PLEASE TELL ME IT ONLY SHOWS A PLAYER IN A VEHICLE BECAUSE SEEING EVERY HUMAN ON THE RADAR IS JUST GOING TO BE A HEADACHE :/ – UNTIL THEN IM SURE THIS GAME IS NOT GOING TO DISAPPOINT ME OR ITS WARHAWK FANS – KEEP UP THE GOOD WORK LIGHTBOX TEAM. That trailer is pure gaming ecstasy. So you guys will only be showing StarHawk on Thursday? Why won’t you take my money and give me access? :( Great game guys and gals! The trailer, wow! This is getting all my attention when it comes out! Very excited. Looks sick, can I get into the beta guys, come on now. How about a vita tie in to frag in space on the go??? Lets do this thing right boys. So are you wearing pants right now? Thanks for all the kind words everyone! Show your friends! Hopefully they will dig it too! @Blkant, from the MP videos(especially the B-Roll footage released) you can see there are weapon pickups scattered around the map much like WH. the only question is wether they are dedicated weapon spawns, or if they fell from a dead soldier. It appears when you die there is no backpack that holds all your goodies. what you were carrying falls around as seperate pickups. which might explain the weapons we see laying around the vids. but my guess is there are dedicated weapon spawns. also, you can build a bunker, sniper tower, etc to collect weapons you need. OK well I’m glad you know. Xesturgy. Why didn’t I think of that. Whoever put together this trailer deserves a freakin’ raise. Srsly, that was awesome. ^_^ Can’t wait for the game! The SONY team in San Diego cut this one together and they really did a great job. Working with them is just one of the many reasons why LightBox Interactive is really lucky to get to work with Sony Computer Entertainment as our publisher. I know that sounds cheesy and kiss-assey, but its true. Our Sony San Diego vid team did it…with a little help from the actual game! What would make this true space flight is if the wold actually rotates when you pitch and yaw your ship. In space there is no up or down. It seems as even though we are in space, there is still clearly an up and down and the world remains the same while the ship is the one that rolls and moves. In space you should be able to maintain flight while inverted because there is no gravity. I don’t know how difficult this could be, but it would make it true space flight, which is what many of us want. No gravity while flying, just pure space dogfights. We have found that a great many players rely on the “horizon” for orientation and control of their ship. We did a lot of testing on this to make sure. That said, we do support a flight mode that allows the horizon to invert and spin while you are flying – but its a player choice. Im a die-hard sim racer but I love space game and must say I think I might get this, I’d love to have a spaceship in the box or a couple of action figures… I most Likely get this.. If it’s downloadable then Likely become Gaurenteed! I’m in a wheelchair I prefer games on my hdd so I don’t have to get up to switch if I’m chillin. Now I feel really bad to say that Starhawk is on Blu-ray and not a downloadable game from the PlayStation Store. I got a chance to play this at a recent trade event and was absolutely blown away. This video is, (overused term I know)…epic. I would love to live in the world where people actually play as a team like this, but regardless, this game was so fun and easy to get into. I cannot wait! Team work is hard to get right but we think we have some systems in Starhawk to really help promote players working as a team. We’ll learn alot during the Starhawk BETA and will be looking to all of our fans for their feedback to help us get it right! Also…thanks to Lightbox interactive for FINALLY making an African American main character that isn’t a ridiculous stereotype. Emmett has no Fro or braids and he isn’t running around with a bird in his hair or screaming about how people need to ride the “train”. He was a very unexpected design from the character master, Tetsuya Nomura! The game looks great and that trailer really left me wanting more. Great to see that coordinated ground troops can take out the hawks. I hope to see teamwork like that in the full game. The topic of team work is key — and it’s hard to get right! The dev-team and I here at LightBox Interactive are always looking for ways to foster good teamwork among players (which is easier said than done). Whether thats through awards or trophies that are unlocked with good team-based triggers or by the design of our Build & Battle parts. We still have a long way to go, but we’re excited about all the work that’s ahead of us! Ok, I love how the game is looking, but the first thing that came to mind when you were talking about different maps, and feels to the terrain and such, blew my mind. I really think that you guys should talk to Guerilla Games and see if you could like remake one of the awesome maps from Killzone 3 for a special cameo-type DLC after release of the game. When i see this trailer, that’s what sings to me, the need for you to really go all out with the maps. Lack of differentiation in the maps, and the fact that i came in waaaaayyy to late in the game is the reason i never got into warhawk, i just couldnt take being dominated like that. But seriously, talk to them, that would be like the most amazing subtle crossover type event in gaming history, or at least to me, because i dont really care about the billions of fighting game crossovers, not a huge fan of that genre, but this one; you’ve stolen my heart. ! ! ! ! ! ! ! ! ! ! ! ! ! ! ! ! ! ! >>>>>>> XMB STATUS UPDATES <<<<<<< ! ! ! ! ! ! ! ! ! ! ! ! ! ! ! ! ! ! Its on track to be the best game ever. Ok everyone — I gotta run into another meeting but I will come back and answer more comments as soon as I can! if santa monica is apart of this games development why aren’t the graphics close to god of war III? I see the potential for a new, more human video game icon in Emmett Graves. And this multiplayer looks like it will NOT disappoint. This game has everything! All that needs to happen now for Nathan Drake to appear in the game and I would go ballistic!! hmm can we get an Emmet Graves skin in Uncharted 3? heh, that’s not too shabby! …Fast forward to today and we are on the cusp of a sick follow up, the million dollar question to SONY is: Will you really get behind Starhawk? Will you market and sell this to the mainstream? I’m talking commercials during NFL games, Emmett on corporate products (burger king, soda cans, etc)..I know all that costs big money, but the gamble is worth it. Warhawk is BY FAR the best multiplayer for the PS3. Unfortunately due to little marketing most people still have no idea what it is. If Starhawk is pushed, it will be adopted by the mainstream and could be the next huge series…I’m talking GTA, COD, HALO huge. Come on Sony step it up. I hope someone with influence is reading this. Other fans have asked the same thing on the facebook page. @dmac80 EXACTLY. Sony please market the hell out of this game!